Adorama has another interesting combo deal with the Apogee Groove Portable USB DAC/Headphone Amplifier and a set of Audio-Technica ATH-M70x Professional Monitor Headphones for $329 shipped. Combining both items, that’s about $270 under the original prices and the best we can find. The Apogee Groove still fetches $300 on Amazon and has yet to go on sale outside of bundle deals like today’s. On top of that, these bundles don’t usually include a pair of headphones as nice as the $299 Audio-Technica ATH-M70x. 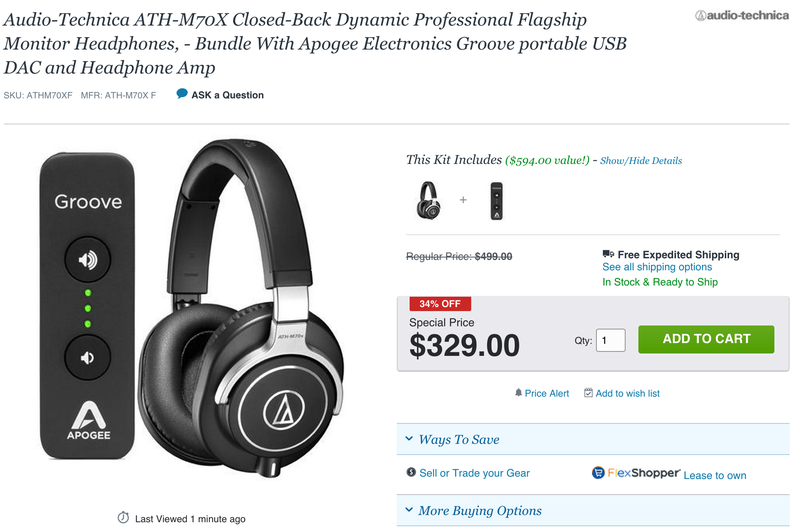 The Apogee Groove has received a 5/5 star rating from 14 Amazon customers and the ATH-M70x headphones have a 4/5 star rating much like the rest of the extremely popular ATH-M series headphones. You can learn more about the Apogee Groove and what it has to offer in our full announcement post.